Obesity is associated with cardiovascular complications, including pulmonary hypertension (PH). Reports suggest that peroxisome proliferator-activated receptor-γ (PPARγ) has direct action in preventing vascular remodelling in PH. Here we dissected the specific role of high-fat-diet (HFD)-induced obesity and vascular smooth muscle cell (VSMC)-PPARγ for remodelling of small pulmonary arteries. Wild-type (WT) and VSMC-specific PPARγ-knockout (SmPparγ−/−) mice were fed a low-fat-diet (LFD, 10% kcal from fat) or HFD (60% kcal from fat) for 24 weeks. Mice were metabolically phenotyped (e.g. weight development, insulin/glucose tolerance) at the beginning, and after 12 and 24 weeks, respectively. At 24 weeks additionally pulmonary pressure, heart structure, pulmonary vascular muscularization together with gene and protein expression in heart and lung tissues were determined. HFD increased right ventricular systolic pressure (RVSP) to a similar extent in WT and SmPparγ−/− mice. HFD decreased glucose tolerance and insulin sensitivity in both WT and SmPparγ−/− mice. Importantly, the increase in RVSP correlated with the degree of insulin resistance. 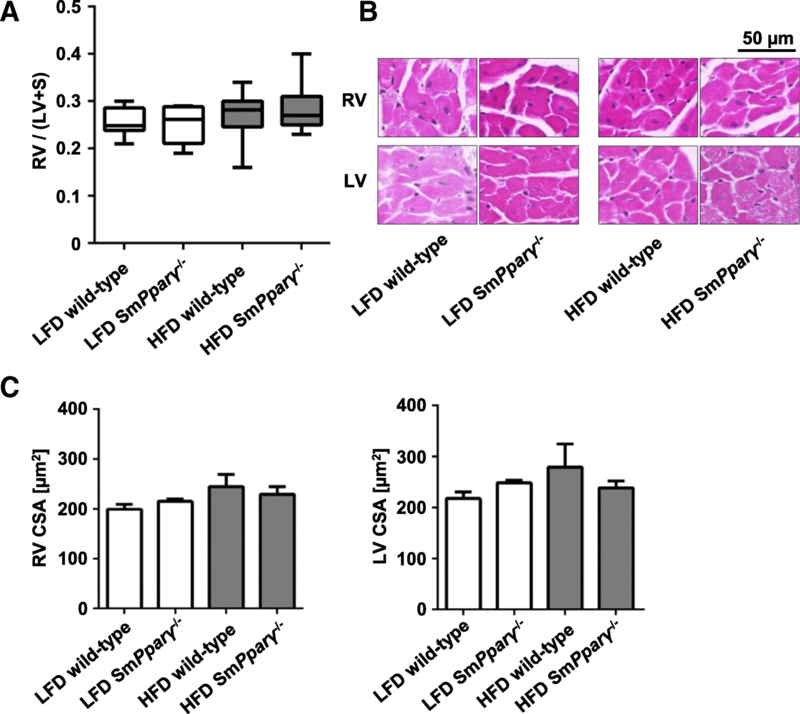 However, VSMC-PPARγ deficiency increased pulmonary vascular muscularization independently of the diet-induced rise in RVSP. This increase was associated with elevated expression of early growth response protein 1 in heart and osteopontin in lung tissue. Here we demonstrate a correlation of insulin resistance and pulmonary pressure. Further, deficiency of PPARγ in VSMCs diet-independently leads to increased pulmonary vascular muscularization. Pulmonary arterial hypertension (PAH) is a disease of the small pulmonary arteries that involves vascular proliferation, remodelling, vasoconstriction and thrombosis [1, 2]. These changes lead to a progressive increase in pulmonary vascular resistance, which results in elevated pulmonary artery pressure of ≥25 mmHg, right ventricular failure and premature death in humans [3, 4]. Cells within the vessel wall, including vascular smooth muscle cells (VSMCs), trigger, sustain and regulate these remodelling processes . PAH occurs genetically [6–8], idiopathically or secondary after e.g. heart failure, chronic lung disease, pulmonary embolism . To date, no curing approach has been established, thus, patients are treated symptomatically to improve their quality of life . Clinical and experimental observations suggest a connection between obesity, insulin resistance and VSMC-driven vascular remodelling including PAH [9, 10], while the molecular mechanisms remain elusive. Patients characterized with PAH were shown to be more overweight . Obesity also triggers comorbidities such as obstructive sleep apnea (OSA) and obesity hypoventilation syndrome (OHS) in patients, directly or indirectly impacting PAH. Indeed, the prevalence of PAH in patients with obesity has been reported ranging from 20 to 47% (body-mass-index of 32 kg/m2 and 37 kg/m2, respectively) [11–13]. Whether diabetes contributes to the risk for PAH or vice versa is a matter of debate. Nonetheless, compared to the overall population, patients with insulin resistance or diabetes have a doubled risk to develop PAH [9, 10]. Further, patients with PAH and diabetes have a significantly reduced walking capacity (six-minutes walking distance), reduced survival and increased risk for pulmonary venous disease with hemodynamics suggesting higher right ventricular diastolic dysfunction. Moreover, diabetics are characterized by significantly higher prevalence of pulmonary embolism . In lung tissue of patients with PAH the expression of peroxisome proliferator-activated receptor-γ (PPARγ) is reduced [15–17]. Moreover, PPARγ agonists have been established in anti-diabetic treatment with beneficial impact on vascular remodelling [18, 19]. Pharmacological activation of PPARγ in VSMCs was shown to decrease their proliferation and migration . Furthermore, in vitro experiments demonstrated that insulin is able to maintain VSMCs quiescence and counteracting growth factor induced dedifferentiation via the phosphoinositide 3-kinase (PI3K) pathway . On the other hand, insulin promotes VSMC migration. During insulin resistance, PI3K signaling is impaired, which may impact on pulmonary vascular remodelling and de novo muscularization of non-muscularized small vessels. While activation of PPARγ restores insulin signaling, the impact of PPARγ in VSMCs in obesity-related pulmonary remodelling has not been determined in detail. The purpose of the study was to address the role of PPARγ in VSMCs in a model of high fat-diet (HFD) induced obesity. Therefore, we evaluated the impact of HFD on right ventricular systolic pressure (RVSP), pulmonary muscularization and metabolic changes in WT and SmPparγ−/− mice. SmPparγ−/− mice were generated using transgenic mice expressing Cre-recombinase under the control of the smooth muscle protein 22-alpha promotor (The Jackson Laboratory, Bar Harbor, Maine) and homozygously floxed PPARγ mice . Eight to 12 week old littermate male WT (Cre-) and SmPparγ−/− (Cre+) mice on a mixed genetic background (C57BL/6, SJL, DBA/2J, C3H) were randomized as follows: WT and SmPparγ−/− fed ad libitum a low-fat diet (LFD) (10% kcal from fat; Brogaarden, Gentofte, Denmark; D12450J) and WT and SmPparγ−/− fed ad libitum a high-fat diet (HFD) (60% kcal from fat; Brogaarden; D12492) for 24 weeks. Mice were housed at room temperature with a 12 h light/dark cycle. After sacrificing, organs were excised, weighed, shock-frozen in liquid nitrogen and stored at − 80 °C until further investigation. Body weight was measured twice weekly throughout the study. Food and water intake were measured for up to 24 h in a LabMaster (TSE Systems; Bad Homburg, Germany) after 12 weeks and at the end of the experiment (24 weeks). At the beginning and after 12 and 24 weeks, intraperitoneal (i.p.) insulin tolerance tests (ITT) using a dose of 0.5 U/kg insulin (Insuman® Rapid, Sanofi Aventis, Berlin, Germany) and i.p. glucose tolerance tests (GTT) with 1 g/kg glucose (Glucosteril, Fresenius, Bad Homburg, Germany) were carried out in ~ 4 h and ~ 12 h fasted mice, respectively. Right ventricular systolic pressure (RVSP), a measure for pulmonary arterial systolic pressure (PASP), was recorded with a Millar® microtip catheter (SPR1000), which was inserted into the right ventricle (RV) through the jugular vein. Systemic arterial pressure (SAP) was measured in the carotid artery. The catheter signal was amplified using a PowerLab® amplifier and converted to corresponding pressure curves using LabChart7® software (AD Instruments, Sydney, Australia). To determine the individual SAP and RVSP three to five tracings at different time points were used. Lungs were perfused with ice cold phosphate buffered saline (PBS) and subsequently with 1% paraformaldehyde (PFA), extracted and fixed in 4% PFA. After dehydration, lungs were embedded in paraffin using standard procedures. To quantify the degree of muscularization of pulmonary arteries, 3 μm tissue sections were stained for α-smooth muscle actin (Sigma-Aldrich, #2547) and von Willebrand factor (Dako, A0082) using standard immunohistochemical protocols. The degree of muscularization was defined by α-smooth muscle actin positive parts as percentage of the total pulmonary artery cross section: non-muscularized: < 25%, muscularized: ≥ 25%. Data are shown as ratio of muscularized to non-muscularized arteries. Furthermore, the medial wall thickness was determined in vessels with a diameter of 20–70 μm as well as the lumen area (defined as the area within the lamina elastic interna). Osteopontin was visualized by standard immunohistochemistry using anti-osteopontin antibodies (polyclonal anti-osteopontin, #AF808, R&D Systems) and immunoreactive area was quantified in five animals per group. The pulmonary artery was dissected and perfused with ice-cold PBS with 1% penicillin/streptomycin (P/S). The artery was incubated in an enzyme mixture (collagenase type I, elastase, trypsin inhibitor) in DMEM supplemented with 20% fetal bovine serum (FBS) for 15 min at 37 °C. To terminate the digestion procedure the arteries were washed with PBS with P/S. The surrounding adventitia and endothelium was mechanically removed, and the artery was cut into pieces and incubated in the enzyme mixture for additional 90 min at 37 °C. Afterwards, primary PASMCs were extracted by centrifugation and transferred to cell culture plates. PASMCs were cultured in DMEM containing 20% FBS and P/S at 37 °C and 5% CO2. Standard immunoblotting was performed using PAGE after protein isolation from aortae. The following primary antibodies were used for protein expression analyses: monoclonal anti-PPARγ (#2443, Cell Signaling), anti-GAPDH (#MAB374, Millipore). Isolated PASMCs were incubated on glass tissue slides and fixed with 4% PFA. Slides were washed three times in ice-cold PBS prior to permeabilization with Triton-X. Following one additional washing step, cells were blocked with 5% BSA and incubated with antibodies against α-smooth muscle actin (#2547, Sigma Aldrich) and PPARγ (#2443, Cell Signaling). Slides were washed, and incubated with secondary antibodies (anti-rabbit Alexa Fluor 488 and Cy3-conjugated anti-rabbit IgG, Jackson Immuno Research) and counterstained with 4′,6-diamidino-2-phenylindole (DAPI) for visualization of cell nuclei. After post mortem isolation of the heart, the right ventricle (RV) was separated from the left ventricle (LV) and ventricular septum (S), and the wet weights were determined. RV hypertrophy was calculated using the Fulton’s index: RV/(LV + S) . Additionally, 3 μm paraffin sections of the RV and LV were stained with hematoxylin and eosin. Cardiomyocyte cross-sectional area (CSA) was determined in the RV and LV as measures of cardiac remodelling. An area of ~ 50 cardiomyocytes in each ventricle from n = 4–5 animals per group were evaluated. Microscopic images were analyzed in an observer-blinded manner applying Cell D Imaging Software. RNA was isolated utilizing the RNeasy Mini Kit (Qiagen, Hilden, Germany) according to the manufacturer’s instruction for purification from cells and heart tissue. Synthesis of cDNA was performed using the High Capacity RNA-to-cDNA™ Kit (Applied Biosystems, Darmstadt, Germany). Gene expression analysis by quantitative real-time polymerase chain reaction (qPCR) (SybrGreen, Applied Biosystems) was performed in duplicate with an Mx3000P cycler (Stratagene; Agilent Technologies) and normalized to the housekeeping gene 18S. The following primer sequences (at final concentrations of 100 nM) were used: 18S rRNA (Rn18s) 5′-GGACTCTTTCGAGGCCCTGTA-3′, 5′-CACCAGACTTGCCCTCCAAT-3′; Osteopontin (SPP1) 5′-CTCCAATCGTCCCTACAGTCG-3′, 5′-AGGTCCTCATCTGTGGCATC-3′, Egr-1 (EGR1) 5′-CCGAGCGAACAACCCTATGA-3′, 5′-CGAGTCGTTTGGCTGGGATA-3′; BNP (NPPB) 5′-GGTCCAGCAGAGACCTCAAAA-3′, 5′-GCCAGGAGGTCTTCCTACAAC-3′ (forward and reverse, respectively). Data were expressed as means ± SEM or medians and ranges in case of data without normal distribution. We analyzed a full two-factor linear model with repeated measurements for the glucose tolerance test (GTT) and the insulin tolerance test (ITT) with SPSS V25 (IBM). The model was constant + diet + genotype + diet * genotype with measurement time series GTT/ITT as inner subject factor. Difference to baseline was chosen as within-subject contrast. The assumption of normal data distribution was checked for 2 × 2 subgroups by a Kolmogorov-Smirnov test with Lilliefors correction. We performed a Box-test to check for homogeneity of covariances of different groups. The homogeneity assumption did not hold, but Pillai-Bartlett trace was found to be more robust than alternatives when the assumption of homogeneity was violated but sample sizes of the groups were equal . If the maximum ratio of sample sizes was 1.5:1 or less, the F statistic is reported to be robust against violation of the homogeneity of variances assumption . This condition holds since our subgroup sample sizes were nearly equal. We report significance of multivariate analysis based on exact F-statistics and Pillai trace. For further testing the with-in subject effects we tested for sphericity by a Mauchly test and used an appropriate correction (e.g. Huynh Feldt) for the within-subject effects. Homogeneity of variance between within-subject contrasts was asserted by a Levene test in GTT and ITT. Significance of contrasts was assessed by an F-test. Model effects (main effects and interactions) were compared with Tukey correction. A full model univariate two-factor ANOVA was performed with other parameters to test for factor (diet, genotype) effects and interaction between factors. Tests for heteroskedasticity were considered. In case of deviation from normal distribution a logarithmic transformation of the parameter was performed. Transformed parameters did not significantly deviate from normal distribution. Additionally, non-parametric tests with original parameters (Mann-Whitney U, Kruskal Wallis) were performed. P-values are given as numbers with the exception of very small p-values (p < 0.001). Alpha< 0.05 was regarded as significant. P-values near alpha are referred to as borderline. Due to the small power type 2 errors are a concern and borderline significance may be neither an assertion nor a rejection of the null-hypothesis. Trends were assessed by correlation analysis. As a prerequisite for evaluating the relevance of PPARγ in VSMCs in PAH, we analyzed expression levels in isolated PASMCs from WT and SmPparγ−/− mice. Immunofluorescence of PASMCs revealed that expression of PPARγ was virtually lost in tissues derived from SmPparγ−/−, whereas clearly detectable in WT mice (Fig. 1a). The VSMC-specific knockout of PPARγ was further validated in isolated aortae using immunoblotting procedures (Fig. 1b). Thus, SmPparγ−/− mice served as a valid animal model for analyses of the impact of PPARγ in VSMCs for metabolic disturbances and pulmonary vascular changes. WT and SmPparγ−/− mice were subjected to either a low fat-diet (LFD) or a high fat-diet (HFD) for a total of 24 weeks. Both LFD- (~ 25% of body weight increase) and HFD-fed (~ 70% of body weight increase) mice displayed significant weight gain over time (Fig. 1c). 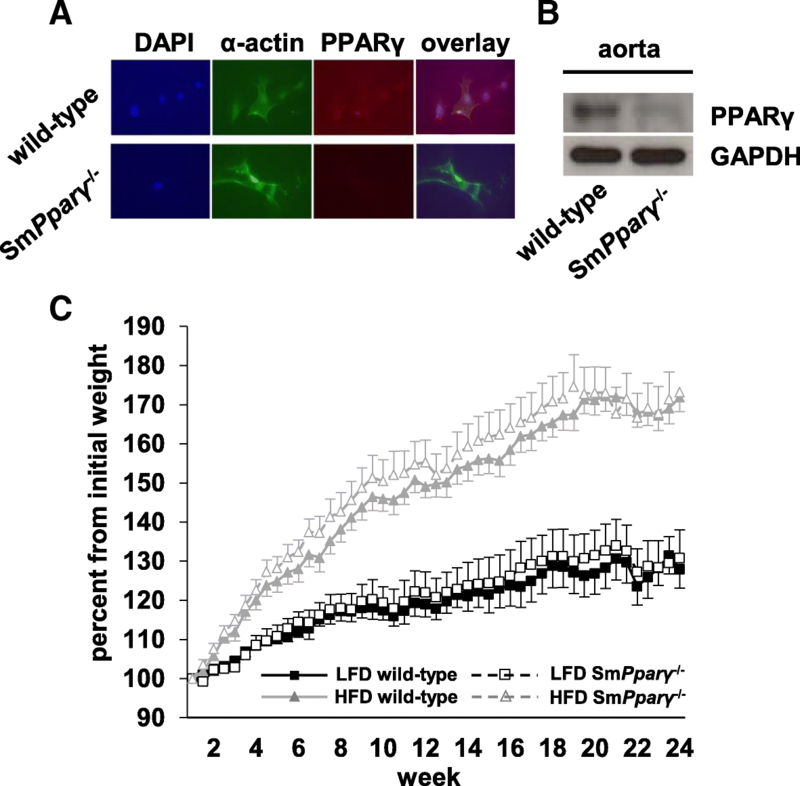 Loss of PPARγ in VSMC (SmPparγ−/−) in HFD mice further enhanced body weight. All study groups were subjected to repetitive metabolic phenotyping. Blood glucose levels at baseline GTT (0 weeks) displayed a similar curve pattern in WT and SmPparγ−/− mice, without evidence of a genotype-specific difference (Fig. 2a). After 12 weeks of diet (Fig. 2b), HFD-fed mice displayed significantly higher fasting glucose levels (p < 0.001) and higher serum glucose throughout the GTT until 150 min, also evidenced by quantification of the area under the curve (AUC; p < 0.001 LFD vs. HFD). 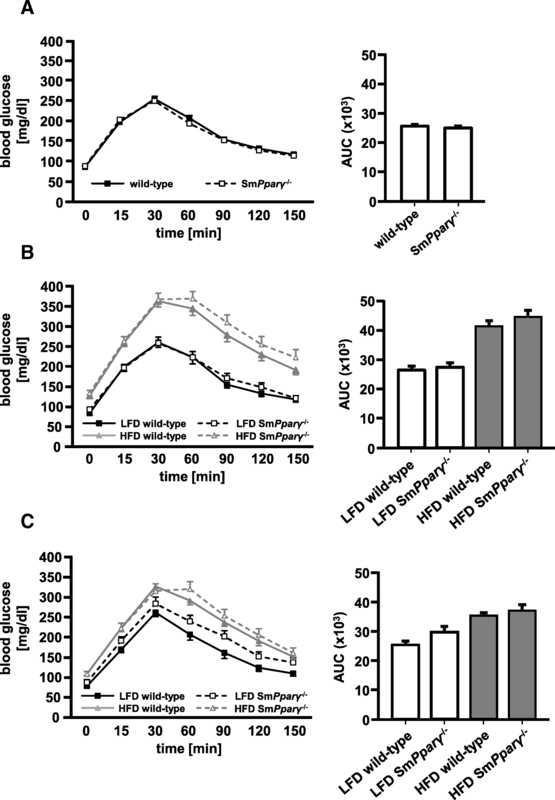 Highest glucose levels were detected at 30 min in HFD-fed WT mice, while the maximum in HFD-fed SmPparγ−/− mice was seen at 60 min, indicating glucose intolerance in these mice. After 24 weeks of diet (Fig. 2c), again glucose levels after fasting as well as after glucose challenge in both HFD-treated WT and SmPparγ−/− mice were higher compared to their genotype-related LFD-treated WT and SmPparγ−/− animals. At baseline (0 weeks) SmPparγ−/− displayed no major difference in insulin tolerance compared to their WT littermates (Fig. 3a). After 12 weeks (Fig. 3b) and 24 weeks (Fig. 3c) only LFD-fed WT mice showed preserved insulin sensitivity, while the other groups displayed insulin resistance. Indeed, this pattern became more evident at 24 weeks, now showing a more profound difference of insulin sensitivity in SmPparγ−/− LFD-fed mice compared to their WT littermates. Thus, SmPparγ−/− in LFD resembled the impact of HFD in WT mice. This underlines an impact of smooth muscle PPARγ for whole body insulin sensitivity. Noteworthy, HFD did not further significantly increase the level of insulin resistance in SmPparγ−/− (Fig. 3c). We conclude that both diet and genotype have an effect on glucose metabolism with a relevant interaction. 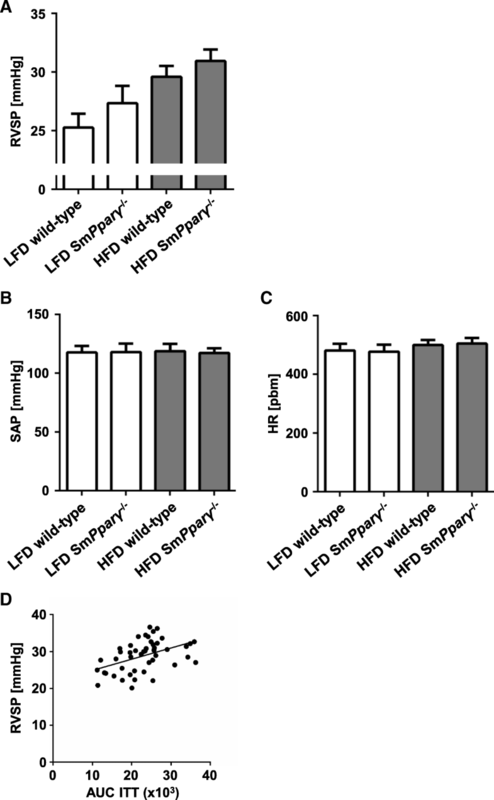 Food intake was equal between LFD wild-type and LFD SmPparγ−/− mice (1.80 ± 0.34 g/18 h and 1.75 ± 0.38 g/18 h) and between HFD wild-type and HFD SmPparγ−/− mice (1.42 ± 0.27 g/18 h and 1.44 ± 0.34 g/18 h). Following sacrificing the animals after 24 weeks, organ measurements were performed. As shown in Table 1, liver and kidney weights were higher in HFD-treated mice compared to LFD-mice. 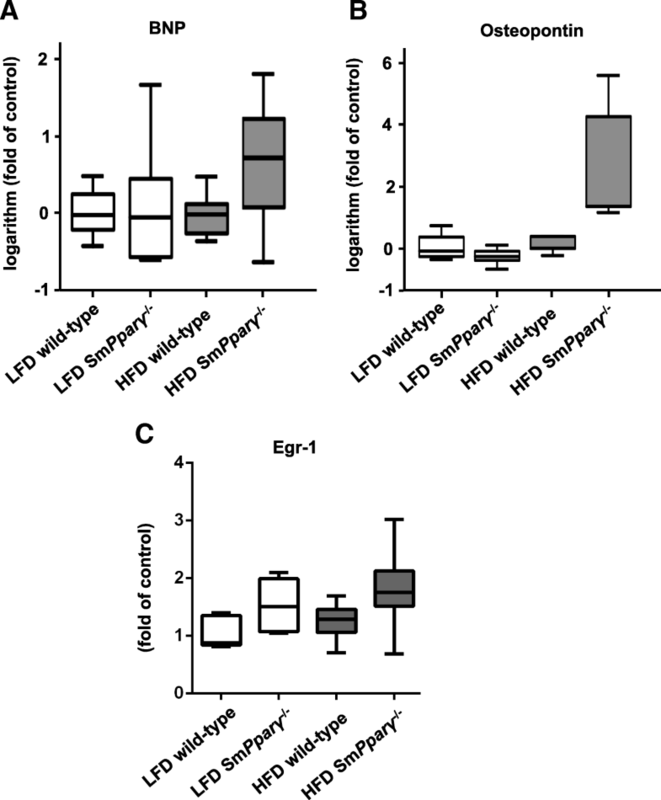 Additionally, perirenal fat and epididymal fat tissue were higher in HFD- vs. LFD-fed mice. In contrast, brown adipose tissue (BAT) remained unchanged under HFD. Right ventricular systolic pressure (RVSP), as a measure for pulmonary artery systolic pressure (PASP), was determined, along with systemic artery pressure (SAP) and heart rate. RVSP was significantly enhanced by HFD without interaction of genotype (Fig. 4a). Of note, SAP and heart rate were comparable in all investigated groups (Figs. 4b, 5 and 6c). We performed additional statistical analyses for potential correlation between insulin sensitivity and RVSP. As shown in Fig. 4d, a significant correlation was calculated, underlining an association between metabolic disturbances and pulmonary vascular pressure. Muscularization of pulmonary arteries is an early crucial morphological feature of pulmonary vascular remodelling. SmPparγ−/− enhanced the proportion of muscularized to non-muscularized arteries in both LFD- and HFD-fed animals (Fig. 5a-b), indicating an impact of PPARγ in VSMCs for de novo muscularization of pulmonary arteries. 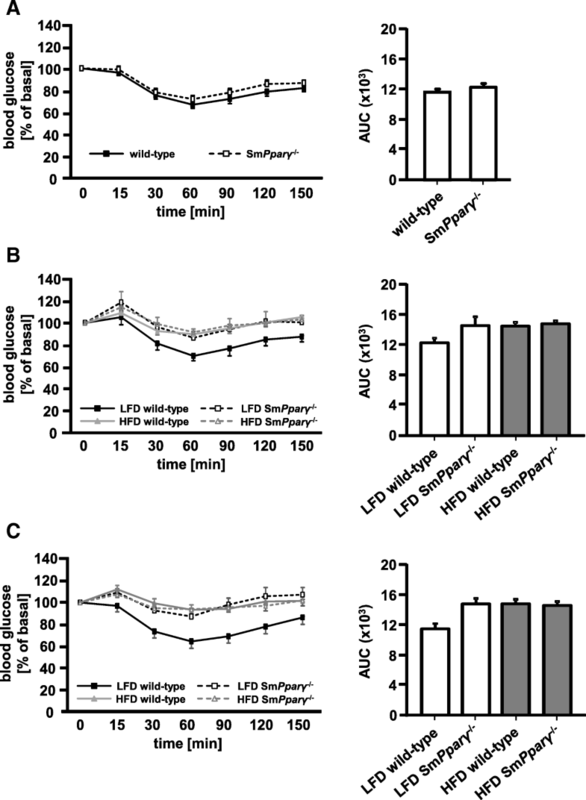 SmPparγ−/− LFD-fed mice displayed increased expression of osteopontin (Fig. 5c), an extracellular matrix protein exhibiting both tissue remodelling and inflammatory properties, which further was established as contributing to PAH , indicating enhanced extracellular lung tissue remodelling in these mice. Similarly, HFD also enhanced osteopontin content in WT animals. As a measure of RV hypertrophy, the Fulton’s index was determined post mortem. The Fulton’s index showed a median of 0.26 (95% confidence interval (CI) 0.23–0.28) in LFD WT animals and did not increase in HFD-fed WT mice (median = 0.27, 95% CI 0.24–0.29). There was no marked difference related to the genotype in both diets (Fig. 6a). Changes in cardiomyocyte morphology are integral components of heart remodelling associated with PAH. Figure 6b depicts representative hematoxylin-eosin stainings and corresponding quantification. We evaluated the cross-sectional area (CSA) of cardiomyocytes as one parameter displaying heart tissue remodelling. Figure 6c depicts that neither HFD nor SmPparγ−/− reached a significant effect on CSA in the RV and LV after 24 weeks treatment in the subgroups. Transcript analyses were performed to detect potential differences in gene expression that had yet transferred to only minor morphological changes but, in particular, functional changes in the RV as demonstrated by increased RVSP. Brain natriuretic peptide (BNP) is an established and widely used clinical parameter for heart function and failure, and ventricular remodelling. While BNP was shown being a prognostic marker in PAH , others ruled out the NT-proBNP response to exercise as a disease severity assessment marker of PAH . No significant upregulation of BNP was detectable in the RV due to the application of different diets (Fig. 7a). Osteopontin had previously been shown being enhanced in the RV in animal models of PH . HFD upregulated osteopontin in the RV (Fig. 7b). Further, early growth response protein 1 (Egr-1), critically involved in vascular remodelling in PAH , was higher expressed in the RV in SmPparγ−/− mice in both LFD- and HFD treated animals (Fig. 7c). Here we show that high fat-diet (HFD) in mice, given long-term for 24 weeks, increases body weight and right ventricular systolic pressure (RVSP), a measure of pulmonary arterial systolic pressure (PASP), similarly in WT and SmPparγ−/− mice. Further, glucose tolerance and insulin sensitivity are impaired by HFD in both genotypes. Importantly, insulin resistance correlates with RVSP. SmPparγ−/− mice display enhanced muscularization of small pulmonary arteries under both diet conditions and also higher osteopontin deposition in the lung. Further, SmPparγ−/− display elevated Egr-1 gene expression. Based on clinical and experimental findings, suggesting an association of obesity, insulin resistance and PAH [9, 10], here we applied an HFD-induced obesity mouse model for evaluation of this association. Since PAH patients are characterized by reduced expression of apolipoprotein E (apoE), earlier experimental settings focused on PAH-development on an apoE−/− background. Male apoE−/− mice not only displayed insulin resistance under HFD-feeding, but also developed higher RVSP along with RV hypertrophy and increased muscularization of small pulmonary arteries . Our study, however, shows that long-term HFD alone results in enhanced pulmonary pressure even in WT mice, without apoE−/− background, when given for 24 weeks. These findings are underlined by data, showing significantly enhanced mean pulmonary artery pressure in fatty compared to lean Zucker rats . In addition, male C57BL/6j mice given an HFD for 20 weeks showed PH evidenced by increased right ventricular end-systolic pressure . Further, insulin-resistant apoE-deficient (apoE−/−) mice on an HFD spontaneously develop PAH  and recently HFD-apoE−/− mice treated with a dual ETA/ETB receptor antagonist were characterized by beneficial effects on PAH . Moreover, a 20-week HFD in C57BL/6 mice also led to significantly higher RVSP compared to mice subjected to standard chow diet, which underscores our data, even though the increase in RVSP was milder in our study (4.3 mmHg vs. 16.2 mmHg, respectively) , probably due to the mixed genetic background of our used mice (C57BL/6, SJL, DBA/2J, C3H) [35–37]. Indeed, a recent publication compared the susceptibility developing PAH induced by HFD in 36 different mouse strains. These analyses demonstrated significant differences with both resistance (e.g. SJL/J, DBA/2J, C3H/HeJ) and susceptibility (e.g. C57BL/6J) of HFD-induced PAH . As expected, HFD time-dependently induced obesity, changes in body composition, and reduced glucose tolerance and insulin sensitivity [38–40]. Clinical observations have shown that diabetics have a higher risk for development and prevalence of PAH [10, 14, 41], with the causal and underlying mechanism yet to be established. Indeed, others failed to establish a clear association between insulin dysregulation and PAH . Nonetheless, insulin resistance in female PAH patients was associated with a lower six-month event-free survival . In our study, we provide evidence for a significant correlation between RVSP and reduced insulin sensitivity. The changes in RVSP and insulin sensitivity under HFD were further accompanied by increased muscularization of small pulmonary arteries. We and others earlier have shown that osteopontin exerts both proinflammatory and chemoattractant properties in remodelling processes, including experimental PAH [22, 43, 44]. In line, we found enhanced osteopontin deposition under HFD treatment in WT and due to PPARγ-deficiency. 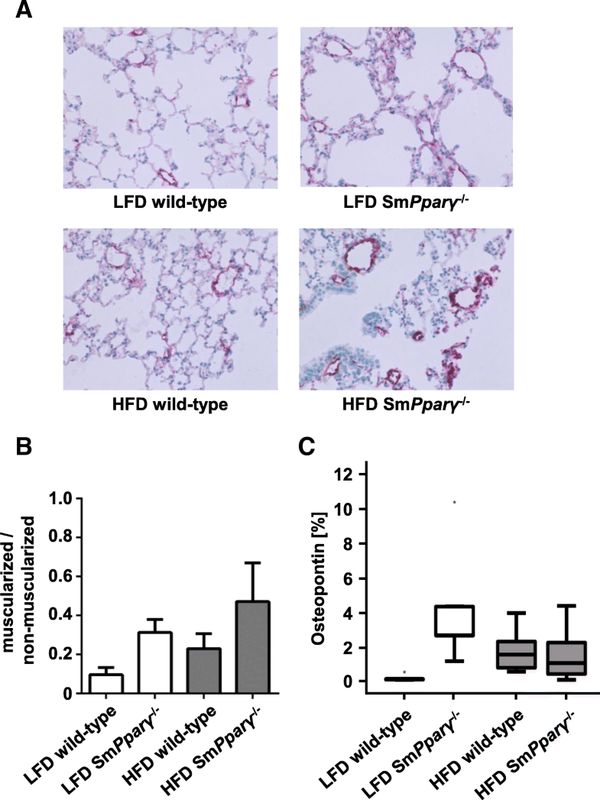 Of note, SmPparγ−/− resulted in higher muscularization of small pulmonary arteries also in LFD mice without enhanced RVSP, suggesting an HFD-independent impact of PPARγ-deficiency. Even though clinical and experimental correlations between glucose dysregulation and PAH exist, it is still a matter of debate whether obesity and metabolic disturbances are a consequence of PAH, representing only a marker of severe pulmonary vascular disorders, or whether a potential pathogenetic relationship with disease initiation and/ or progression exists. While in patients obesity-related PAH was initially considered secondary to hypoventilation and lung hypoxia resulting from increased mechanical overload in excessive fat tissue [45, 46], some observations have questioned the indirect relationship and favor metabolic and/ or inflammatory pathways triggering PAH [10, 32, 47]. Based on previous findings that PPARγ is less expressed in lung tissue of patients with PAH  experimental data showed that insulin-sensitizing PPARγ agonists reduce PAH in rodent models [9, 31, 43, 48, 49]. In addition, with TGFβ1 acting pro-proliferative in VSMCs it was recently demonstrated that pioglitazone even reversed PAH in TGFβ1-overexpressing mice  and in the SU5416/hypoxia (SuHx) rat model by normalizing epigenetic and transcriptional regulation . We thus analyzed SmPparγ−/− mice with regard to both RVSP and the metabolic phenotype in an experimental model of obesity. SmPparγ−/− mice displayed impaired insulin sensitivity in mice even subjected to LFD. While we analyzed mice at a final age of 32–36 weeks, these data are in line with Hansmann et al. showing that younger SMC PPARγ−/− mice develop spontaneously PAH on a regular chow diet. Glucose uptake is mainly driven by peripheral tissues, e.g. skeletal muscle. Food intake was not significantly different between both diet and genotypes in our study. Off-target effects of SmPparγ−/− in other muscle tissue, including skeletal muscle, cannot fully be ruled out. Interestingly, knockout of PPARγ in VSMCs enhanced pulmonary vascular remodelling. Therefore, increased muscularization in small pulmonary arteries, even in LFD-fed mice, is in favor of a rather cell-specific knockout. The expression of Egr-1 has been shown to be increased in pulmonary vessels of PAH patients . Knockout of PPARγ in VSMCs enhanced Egr-1 gene expression in RV in both LFD- and HFD-fed mice, suggesting an indirect effect due to pulmonary vessel remodelling. Gene expression of osteopontin, an extracellular matrix protein exhibiting both tissue remodelling and inflammatory properties, was higher in HFD SmPparγ−/−, which was also shown earlier in an MCT-induced model in rats . Interestingly, while HFD led to enhanced osteopontin content in lung tissue in WT, also knockout of PPARγ in VSMCs in LFD mice was followed by a significant rise, while there was no further increase in HFD-SmPparγ−/− as compared to LFD-SmPparγ−/−. An important limitation of our study is that SM22α-Cre deletes also in myeloid cells therefore non-SMC dependent effects of our observations cannot fully be ruled out. Further, others have shown that transgenic mice (expressing dominant-negative mutations in PPARγ) are characterized by both impaired vasodilation of the thoracic aorta and systolic hypertension , implicating a relevant impact on larger arteries. In contrast, we focused on the role of PPARγ in VSMCs impacting on PH and thus small arteries. We cannot fully rule out an additional effect on larger arteries. In our animal model, however, a major impact seems less likely since systemic arterial pressure between genotypes did not differ. In conclusion, HFD leads to an increase in pulmonary arterial pressure, substantiating the interplay of metabolic disturbances and pulmonary vascular remodelling. This is also evidenced by a correlation between insulin resistance and RVSP. Knockout of PPARγ in VSMCs resulted in attenuated insulin sensitivity and enhanced pulmonary vascular muscularization. PPARγ in VSMCs is supposed to play a critical role in PAH-associated pulmonary remodelling, in addition to obesity-related pulmonary hypertension. The authors are grateful for excellent technical assistance by Marion Müller and by Doris Petzold. This study was supported by a grant of the Marga and Walter Boll Stiftung to EC and KK (210–04-109). MT was supported by PhD student scholarships of the Charité-Universitätsmedizin Berlin and the Sonnenfeld Stiftung. EC and KK designed the study, were involved in animal preparation, performed data analysis and figure preparation, drafted and edited the manuscript. MT acquired and analyzed study data and was involved in manuscript preparation. AB and EB acquired and analyzed study data and were involved in revising the manuscript. MO acquired study data and was involved in revising the manuscript. EW performed statistics and was involved in revising the manuscript. All authors read and approved the final manuscript. The study was conducted in accordance with institutional guidelines and approved by the Landesamt für Gesundheit und Soziales (LAGeSo, Berlin, Germany) and the Landesamt für Natur, Umwelt und Verbraucherschutz Nordrhein-Westfalen (LANUV).